This is my second time reading this since I first read it back when I was a little girl (and reading it for the first time). I’d say both experiences reading it were extremely enjoyable, but in different ways. First time reading it, this was a brand new world and I anxiously awaited to see what would happen next. However, reading it now and understanding what is going to happen later on, the amount of foreshadowing and references to characters that we all know and love by now is overwhelming. And I’m not going to lie I got a little teary eyed reading this at some points because all the kids are just so innocent and they have no idea what is ahead of them (or their imminent deaths) *Cue loud sobbing*. No matter what though I do love the entire world built by J.K. Rowling and how she has taken so much care to reference things that will come up later on and make them seem not that important, when in reality they are huge plot points for the story. 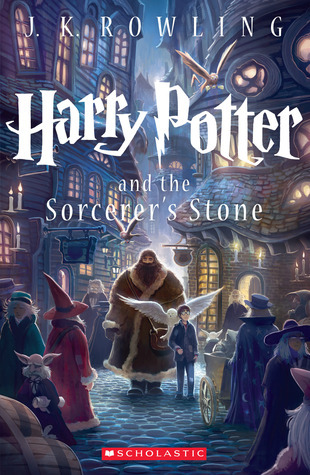 So, while this is one of those feel-good novels that makes me remember my childhood and days gone by, I also like thinking ahead of what’s to come with all these characters and the future of the wizarding world. Also, definitely have to say that my favorite part of this whole novel is when Fred and George bewitch snowballs to be thrown at Professor Quirrel (aka Voldemort). The twins are definitely my favorites from the whole series, now that I look back. One just can never get enough Harry Potter in their lifetime right? Great review! I will never grow sick of HP. My fav books of all time!